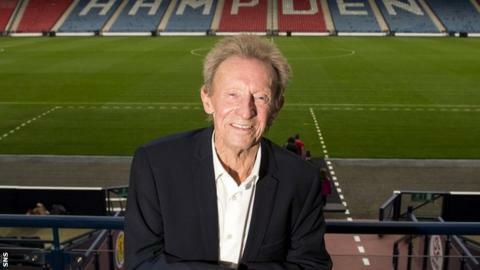 Former Manchester United and Scotland striker Denis Law is "proud" he can at last put CBE after his name - having been the victim of a false alarm. The 75-year-old has been recognised in the New Year Honours List. "Somehow, somewhere along the way, someone's been misinformed that I had already got that many years ago," Aberdeen-born Law told the BBC. "Every time I went on the computer it was there and eventually I got it deleted and I felt a bit better then." Law, capped 55 times by Scotland, was nevertheless still surprised when he was informed he was being made a CBE for services to football and charity. "You don't expect anything like that - it goes to other people," said the former footballer, who now lives in Cheshire and has been a fundraiser for Cancer Research UK and a patron for the Meningitis Now charity. "It was a letter through the post which went to my old address - one that I left five or six years ago - and the postie, who is the same postie, thought 'this must be for Denis'. "So it might have gone there a few years ago! "To get something like this is very pleasing. Quite proud really." Law played for Manchester United between 1962 and 1973, winning league titles in 1965 and 1967 and the FA Cup in 1963. He is one third of the club's 'Holy Trinity', along with Sir Bobby Charlton and the late George Best. He remains joint-second in the club's all-time goalscoring list behind Charlton, with Wayne Rooney having equalled Law's tally of 237 goals in November. Law was named European Footballer of the Year in 1964 but was injured for the 1968 European Cup final, in which United beat Benfica 4-1 at Wembley. He had two spells with Manchester City either side of his 11-year stint with the Red Devils and remains a firm favourite at Old Trafford. In his second spell at City, he scored with a backheel against United as they were relegated from the top flight at the end of the 1973-74 season. It proved to be Law's final touch in league football as he asked to be substituted immediately, later saying: "I have seldom felt so depressed as I did that weekend." Law, who began his career at Huddersfield Town and also played for Italian club Torino, scored 30 goals for Scotland and described his first senior cap as the greatest moment of his career. He rounded off his career by playing at the 1974 World Cup in West Germany. Law recovered from prostate cancer in 2003 and had a son who suffered from meningitis. "Football, that was just the game I loved, then the charities I was involved in, young kids, cancer research, etc, I was giving something back," he added. "Most of the guys in the football world have come from working-class families and to get something like this is something special."